after watching lupe fiasco, i moped around for a couple hours just walking around and talking to my friends. then once it hit 4:45 i went to the media tent and took advantage of the free connie's pizza. while devouring my dinner, i happened to run past lupe fiasco and told him he did a good job today and he thanked me. after eating the pizza i went to the myspace tent and saw !!!. the lead singer had amazing energy during his set and he was dancing all around. at one point of thier set he even ran over to the sign language platform and was dancing. after some of !!! i headed on over to the bud light stage to watch my favorite band this summer, modest mouse. this was my first time seeing them so i was excited. i got there a little late, so i was stuck in the back watching them, and watching on the projector. after a few songs i saw my friends and we pushed ourselves up to like the 10th row. up here i could finally see isaac brock and the rest of the band perform. even though i have seen a lot of bands, i'd have to say that modest mouse is one of the, if not, the tightest sounding live band. the whole band seems to be on the same page with each other, even when having two drummers and having a new guitarist, johnny marr, in the band. the crowd seemed to be loving modest mouse as much as i did. the crowd was yelling for an encore, but being lolla and having stage right next to each other and a set time schedule, modest mouse could not perform another song. after a fun set from modest mouse, i rushed myself over to the myspace stage, which is on the other side of the park, to see tv on the radio. they were already 15-20 mins into their set. tv on the radio seemed to have drawn a huge crowd for their performance. that might be because pearl jam was going to be going on on the stage right next to them, or that because chicagoans really like them....but everyone was digging them. i was captivated by their performance from the second i got there. they played a lot of the hits off of "return to cookie mountain" and "ok calculator". one thing i noticed while watching their performance was that the lead singer didn't sound a lot like he did on the cd, not saying that that's a bad thing. it seemed that on cd he sang a little higher, but live he sang in a normal voice, which i thought made the band sound good live. tv on the radio ended a solid 45 min set (15 mins shorter than most bands because of the pearl jam set) with the crowd cheering encore for about a good 5 mins. after their set they all just walked off stage and sat on the hill next to me on where the myspace stage was set up. so i started to talk to them and asked them if what would of happened if they played a encore, just as a joke, and they said that lolla would of probablly just cut the speakers out. i don't understand why they didn't play another encore though, pearl jam didn't go on for another 10 mins. after talking to tv on the radio and watching pearl jam from the hill for a little i went off looking for my friends. after i found them, we sat down on the softball fields and just talked about our lolla experience while pearl jam was playing. 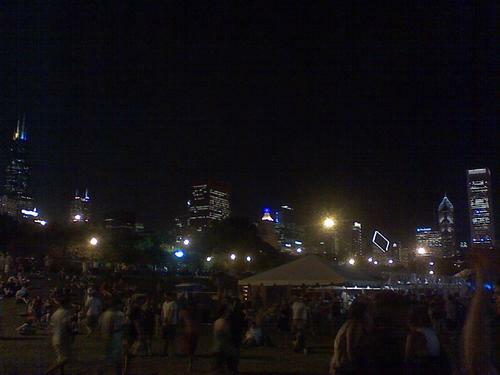 it was quite a way to finish off lolla, just reflecting on what happend during the 3 day stay at lolla.